Please see section 2.1 to know more about ticket status. The status changes to &apos;Answered&apos; when staff replies to the ticket. The status reverts back to &apos;Unanswered&apos; when customer adds a reply to the ticket. At any point if customer replies to &apos;Archived&apos; ticket the status changes to &apos;Unanswered&apos;. 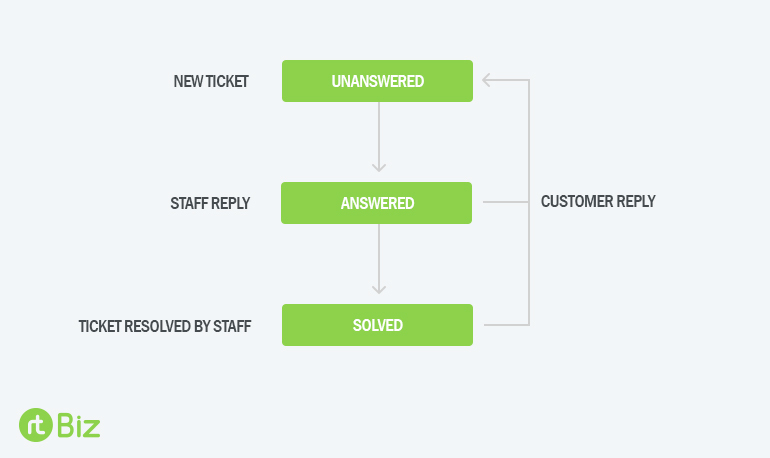 Staff can keep a ticket &apos;Unanswered&apos; while replying by checking &apos;keep unanswered&apos; option. Apart from the auto-change features, all staff members have an option to edit the status either from the Status dropdown present in ticket&apos;s Web UI or from the ticket&apos;s backend.